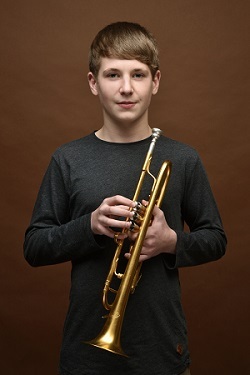 Niklas, born in 2002 in Zerf (Germany), got his first trumpet lessons at the age of eight. Since 2012, Niklas is a student of Mario Berend at the Regionale Musikschule Grevenmacher. In 2015 he took part in the national competition Jugend musiziert and was awarded a 1st Prize. He also participated several times at the Concours Luxembourgeois pour Jeunes Solistes in Luxembourg awarded several 1st Prizes. In 2016 he won a gold medal in the division ‘honour’, the Prix SACEM, Prix Francis Goergen and the EMCY Prize 2016. Niklas is also member of the ‘National Youth Wind Orchestra Luxembourg’ and the Landesjugendblasorchester Rheinland-Pfalz. If you are interested in working with Niklas, please get in touch with the EMCY Office.